Jesus reveals to us all we need to know about God. 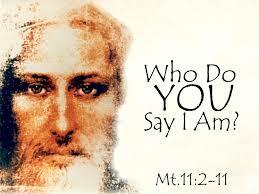 He reveals to us the ‘Father’ who is His father and our father. He reveals, too, that he is the Son, but that the Son is one with the Father, which some who take no care to pray and study Scripture, interpret as meaning that He is the Father; He is ‘one’ with Him, not Him. In asking how this can be so, we ask what it means to ‘be one’, and in doing that we enter on the road to the understanding that God is One and Three. Jesus came among us, the Spirit moves among us, and we are guided, through Grace, to be one with God; but that does not mean we will be God – there is not some strange absorption of ourselves into some Borg-like creature; there is an eternal felicity the nature of which is not revealed to us; we are told what is needful for our salvation. So we should be distrustful of any who say to us there is a new revelation. From the coming of the Spirit to the second coming of the Lord, we have been equipped with what is needed for salvation. Those who were ‘saved’ became the church, those called out from among the unbelievers; as it was then, so is it now, and so will it be until He comes again. We have, through Jesus, been given insights into the deep mysteries of the universe – we are told God is One and God is Three, and he who claims to understand the fullness of that would be a brave fellow. We are told God is love, and yet we see the evil of hatred in ourselves, and yet we are made in His image. We see the prospect of salvation and fear the fires of hell. In the tension between these things, we strive, in fear and trembling, to work our salvation with the help of the Spirit and our fellow Christians. There isn’t much difference in this type of language than when Christ said, ” . . . the two shall become one flesh?” It seems to me that what is operative in all of this is Love. Love for one’s spouse makes of them two in one flesh. And their children become, as it were, part of a home church through love. Our souls are espoused to God and we become children of God. Christ is one with the Father through His Love of the Father. No wonder we speak of the Church as the bride of Christ; for we are betrothed and it is the only way (through the love we bear Him) that we have any hope of attaining the status of being ‘children of God.’ The love and charity He bore us first has been sent as the Holy Spirit to bind our souls to Him. A great mystery but it does have some common sense to it as well. It is why the saints never tire of repeating the words: Peccavi, Domine, miserere mei. “I have sinned, Lord, have mercy on me.” For we should convict ourselves of any, even slight, breach between our love for God and the love He has shown us. He has, and he will, if we repent, forgive us. And should we repent often that torch of love will continue to burn in our souls. If we do not, it smolders and might even be extinguished. Jesus is the glory of the Lord. Did anyone say otherwise? Do you just cut and paste without putting your brain in gear first? No one said otherwise you twit. No one said there was – you really have the spirit of the Father of Lies. You get awful antsy when i post scripture, my good brother. I get antsy when you quote it with no understanding. Jesus is the Son, not the Father – which bit of Scripture do you understand? Knock and that door and this time wait for Jesus, not Satan. Well im following the thread and saying who he is. Too bad you dont believe what you see in scripture. God says mant times in Isaiah that he is God and THERE IS NONE ELSE. Its Him and Him alone up there. Jesus is the Lord of Hosts, and there is none else, he knows not any. But you guys have bigger probs. Our lives are but grass…gone in an instant. Once in the grave, there is no more chance of being saved, if one isnt saved at the time of death. And sorry, but good ol sister Mary isnt praying for nobody at the time of their death. Either one is saved or not. Good sister Mary has nothing to do with it. Say, how come when good brother Servus cuts and paste a scriputre you say” how nice” and when i post a scripture , you say my father is the Devil? Servus at least gives us the chapter and book name. kind of. not all of us know that much about the bible. Maybe you should go to sunday school. Its free. So, if you dont learn anything, you dont have to ask for your money back. but bosco, i’m not paying for school–yet. i’m on a scholarship. Interestingly some of the Greek manuscripts of John 1:18 actually say ‘the only begotten God’, which is another confirmation of Jesus’ deity. Yes, so I understand, which, as you say, makes the point even more positively. The new American Standard Version has ‘the only begotten God’. Bosco you need to consider who it is doing the begetting!